Franklin-Monroe’s Chloe Peters goes in for a score against Fort Recovery on Tuesday night. The Indians won the game, 49-44. 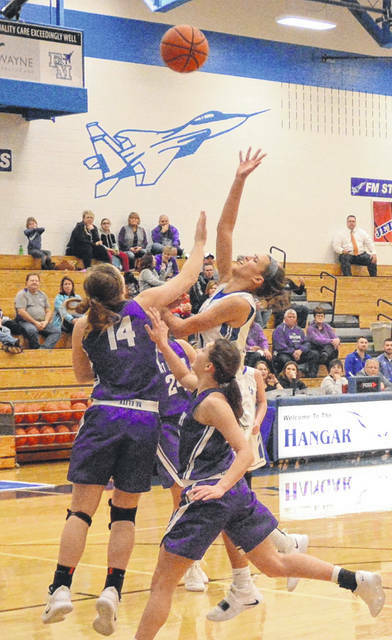 Franklin-Monroe’s Corina Conley puts up a shot against Fort Recovery on Tuesday night. The Indians won the game, 49-44. Franklin-Monroe’s Kennedy Morris takes a 3-point shot against Fort Recovery on Tuesday night. The Indians won the game, 49-44. Franklin-Monroe coach Abbey Moore talks to her players during a break in the game against Fort Recovery on Tuesday night. The Indians won the game, 49-44. Franklin-Monroe’s Belle Cable brings the ball up the floor on a fast break against Fort Recovery on Tuesday night. The Indians won the game, 49-44. Franklin-Monroe’s Chloe Peters puts up a shot against Fort Recovery on Tuesday night. The Indians won the game, 49-44. Franklin-Monroe’s Corina Conley goes in for a score against several Fort Recovery defenders on Tuesday night. The Indians won the game, 49-44. 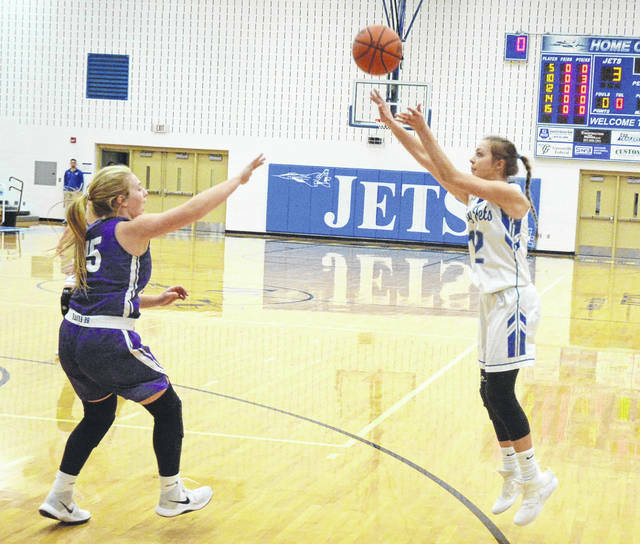 PITSBURG – The Franklin-Monroe Lady Jets managed a strong start against the visiting Fort Recovery Indians on Tuesday. They had a decent 8-point lead at halftime against a taller and deeper Fort Recovery team. It may have been that depth or maybe the team just hit a wall. 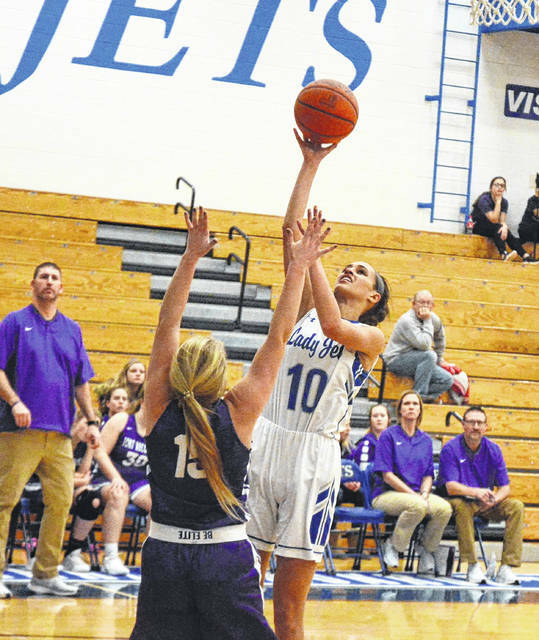 They entered the last quarter with a slim 3-point lead, but then they hit a dry spell where they went scoreless for about 4 minutes and allowed Fort Recovery to build a 9-point lead. They drew to within 2 points with 16 seconds left, but could not close the gap as they would end the game with 49-44 defeat. 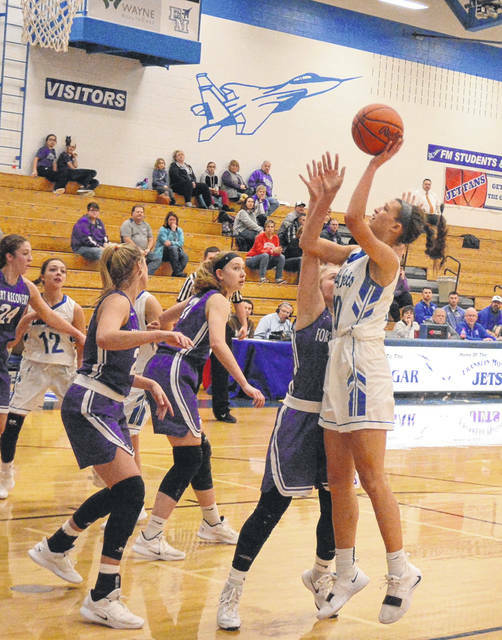 Fort Recover had two 6-foot post players they could put on the court and this made the Jets have to play a scrappy half-court defense where they got the ball from turnovers and hustled after loose balls. They mainly played a man-to-man defense and slipped into a zone for awhile when the Indians really started to work the ball into the post. 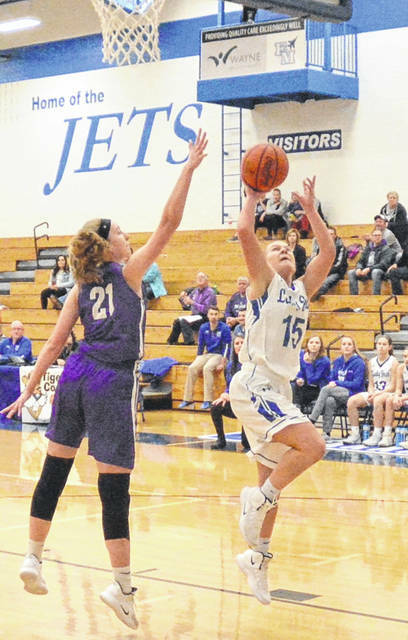 In one sense, it was also a battle of the bigs where 6-foot junior Corina Conley would lead all scorers with 24 points, but her counterpart – 6-foot Indian Val Muhlenkamp would be right there with her and scored 21. Both players can score close to the hoop, but both can also hit the outside shot. Conley did most of her scoring in the first half where she scored 18 points. With Muhlenkamp it was the opposite. She scored 13 of her points in the second half. The Indians started with a zone, but they went to a man-to-man defense after the Jets showed that they do damage shooting from the outside. They also began to do full-court pressure, which they would do throughout the game. 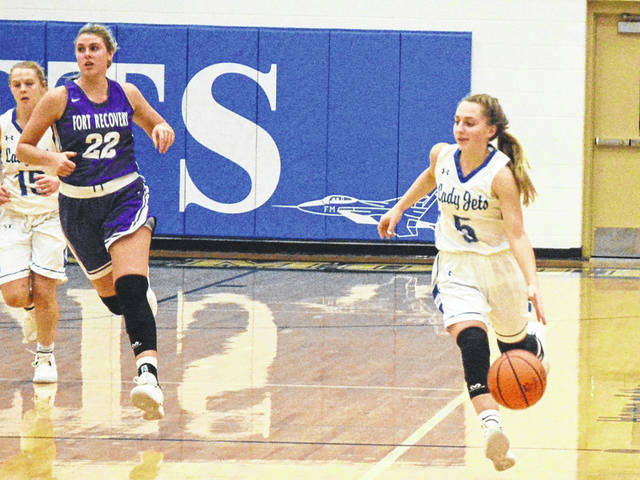 It kept Franklin-Monroe from getting a break as they had to play pressure defense at one end of the court, then work hard to get the ball back down court just to run its offense. 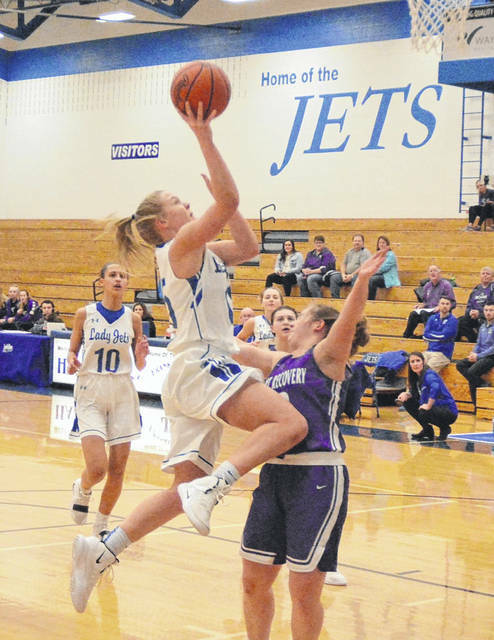 Scoring was more distributed for the Jets in the second half, but their lead had shrunk to just 3 points at the end of the third quarter. For inexplicable reasons their offense was stone cold when they answered the final bell. Fort Recovery ran off 12 points out of the chute. It did not help that Conley got her fourth foul and had to go to the bench during this run. However, the Jets finally found their offense and made a challenge in the closing minutes. Chloe Peters would score 8 of her 11 points in the second half and got the team within 2 points with a basket at the 16-second mark. It was 46-44, but the Indians shot well from the foul line to extend their lead and held off the comeback attempt for the win. Next she was asked about Corina Conley and Chloe Peters. 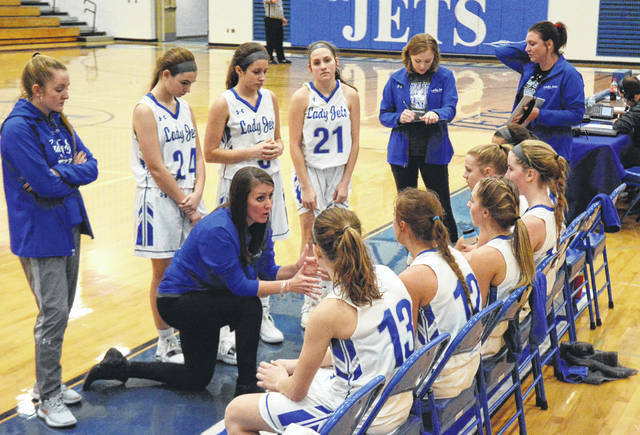 The Jets have just a few games left before the start of the sectional tournament, and will be looking to finish strong the rest of the way to get a decent seed.